If you plan on bringing a Quaker parrot (Myiopsitta monachus) into your life, then it's time to start learning about the species' specific dietary requirements. With the right nutrition and care, Quaker parrots can sometimes make it past 20 years in age. 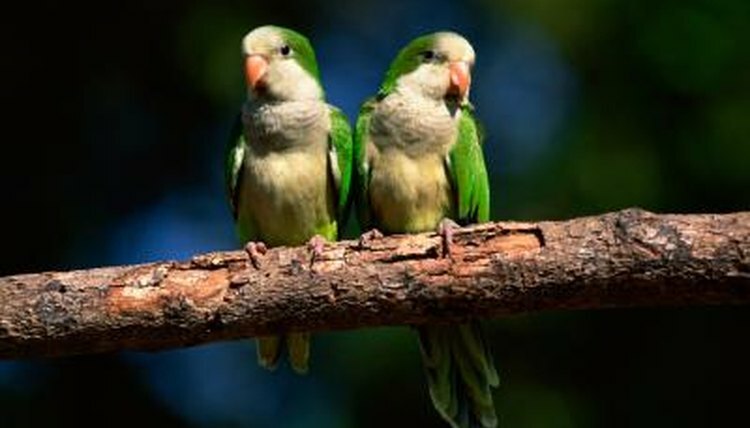 These conversational pet birds are also frequently known as "monk parakeets" and "hooded parrots." Pellets make a nutritious basis for a Quaker parrot's meal plan. Look for commercial mixes that are specifically marked as being suitable for these birdies. They should consist of a little more than half of a Quaker parrot's total food intake. In tiny and measured amounts, sunflower and safflower seeds also can be fed as well. Remember to keep seeds as occasional treats—they are fatty, after all. Birds across the spectrum reap the benefits of regular servings of fresh fruits and vegetables, and Quaker parrots are not excluded. Supplement your bird's pellet-based menu with diced fruits and veggies—all fresh. Some parrot-friendly options are broccoli, carrots, apples, oranges, chard, pears, lettuce, corn, peas, green beans, celery and pomegranates. Refrain from feeding your bird any produce until you have confirmation from an avian veterinarian that it is indeed safe and nutritionally beneficial for him. Most fruits and vegetables are not hazardous to Quaker parrots and other avians, although avocado is definitely an exception to the rule. Avocado is poisonous to birds across the board, and because of that it is crucial to never allow your Quaker parrot to eat it. It is also vital to rapidly throw away any fruits or veggies your parrot chooses not to eat. Do not allow spoiling produce to linger in your pet's cage. If it's not gone in the span of a few hours, do away with it—and all of it. Out in their natural habitats, Quaker parrot diets are similar to those of their captive counterparts because they also involve lots of fruit. They also include plenty of green stuff—think grass and foliage buds. Other elements of their wild diet are blossoms, thistles, pumpkin seeds, nuts and even agricultural crops, from citrus to corn and sweet potatoes. These diurnal birds are not fully herbivorous, as they do their fair share of munching on bugs, too.